For the second consecutive week, you will not be seeing the world’s best golfers competing on the PGA Tour. That is what normally happens after Augusta, as the tournament simply takes a physical and mental toll on the players. This weekend in San Antonio is the Valero Texas Open. Local San Antonio fans can be excused for not attending the golf if they are cheering for their San Antonio Spurs, who have a 2-0 lead on the Memphis Grizzlies in the Western Conference quarterfinals of the first round of the NBA Playoffs. Those golfers who will be present in San Antonio are a large number of talented Americans. They include Charley Hoffman, Brendan Steele, Matt Kuchar, Jimmy Walker, Billy Horschel and Ryan Moore. Of the six mentioned, the golfer you should possibly keep an eye on is Steele. 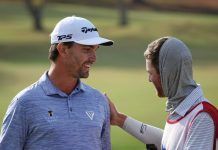 A 34 year-old native of Idyllwild, California, Steele has made eight cuts in eight PGA events he has participated in 2017, including two top ten finishes—a sixth place finish at the SBS Tournament of Champions in Kapalua, Hawaii and another sixth place finish at the CareerBuilder Challenge in La Quinta, California in January. However one must realize that the top ten finishes each came in January. Over the last three months, the highest Steele has finished was 14th at the Honda Classic. Still in most golf pools, you get points if you select players who make the cut, and Steele needs to be highly considered for his consistency. Steele will also be trying to win a tournament on the PGA Tour for the second consecutive calendar year. In the fall of 2016, he shot a four round score of -18 to beat American Patton Kazzire by a stroke at the Safeway Open in Napa, California. On the Canadian golf scene, you should strongly consider taking Adam Hadwin of Moose Jaw, Saskatchewan/Abbotsford, British Columbia once again. Like Steele, Hadwin has shown great consistency and has made the cut in every event he has entered. In other Canadian golf news, it was a very special day for 2003 Masters champion Mike Weir of Sarnia, Ontario. Even though Weir is not retired from golf, it was announced on Wednesday at a prestigious press conference in Toronto, that he will be inducted into Canada’s Sports Hall of Fame later this year. The induction ceremony will be once again in Toronto even though the Hall of Fame is located in Calgary.